Mythology is often the first exposure to Paganism that we experience. I can recall being exposed to Greek myths throughout my career in school. From elementary to college, mythology has been there. There is one problem with the way myth is dealt with in and outside of academia: it is not treated as a living tradition. A living tradition by my definition is a tradition which is (a) functional and (b) meaningful for use as a way of life and understanding life. The functionality of a living tradition means that the tradition does something and it works for the followers of that tradition. Functionality leads to meaningfulness, which is the sense of purpose, wisdom, and knowledge. Functionality and meaningfulness are the two criteria I use when evaluating a tradition for their incorporation into my spiritual practices. Qabalah is a good example of this. Qabalah as a knowledge system provides function and meaning. It is a system that does something and works. Does that mean Qabalah is “true?” Maybe not in the way scientists think of what is true or not. But it is true if it works for you as a system of understanding and wisdom. In academia, mythology does not receive the same treatment as world religions because of the notion that mythology is dead religion. While classicists do treat myth seriously, they only do so as an artifact of ancient culture. Myth functions as a means to understand a past culture, not as a means for living today, or understanding a current culture, or as a knowledge system for relating to the divine and the world. The distinction between how we approach and understanding mythology in and outside of academia is obvious to me. The Crash Course series is a contemporary example of this. Crash Course offers free educational videos on various topics on YouTube. Among their various series, they include World Religions and Mythology. When you compare the discourse and evaluation of the two topics, you will notice they are dealt with differently. There is a more serious tone with World Religions compared to the comical treatment of Mythology, which often includes mocking and jokes. Why is mythology treated like this? Why do we mock myth? Mythology is mocked because society views myth as primitive stories attempting to explain the unknown. Mythology is mocked for being thought of as false stories, fantasies, immoral, violent, and so on. Much of this comes from Christian culture which directed how we viewed the world. There were “pagan” critics of mythology, but I think we take those criticism to have more importance than they really had in their time, or maybe that we are not understanding the sense those criticisms had in their own context. The mocking of myth is deeply rooted in our consciousness. On a visit to Poughkeepsie this year, I stopped into the local Barnes and Noble to muse around. I came across a book in the bargain section, Classical Mythology by British historian H.A. Guerber. It looked to be a solid book, comprehensive with many myths. I bought it, $8 was not a lot anyway. Reading three pages into the book and the author has disparaged the myths of Greece as immoral and ignorant. Greco-Roman polytheism is argued to be inferior to the Judeo-Christian tradition. Such an attitude and evaluation of myth reflects poor scholarship. The author’s attitude stems from improper understanding on Greco-Roman religion. Guerber reads the myths literally, a grievous error that many still fall into when reading myths. Many believers in the Christian tradition approach their texts with a literal eye. The Virgin Birth was literally a virgin birth. Jesus literally walked on water, raised the dead and would later be resurrected after his crucifixion. Applying this mindset to myths, with the presumption that the myths are untrue, will lead the reader to think one thing, how silly and crazy these stories are, how could anyone actually believe them? Literalism in myth plagues paganism today, as a carry-over from our exposure to monotheism. We tend to treat mythology as evidence for how the gods literally behave. In one of my first posts here on Patheos, “We Don’t Have Relationships with the Gods, or Do We?” – I questioned the assumption that relationships with gods were possible. The rebuttals I received cited myth as evidence of relationships between mortals and humans. This brings us to two approaches to myth, the poetic and philosophic. The poetic approach views mythology as literal/concrete while the philosophic approach views myth as having deeper meaning. The latter requires little analysis while the former requires contemplation. Sallustius, writing in the 4th century of the common era, shows us the philosophic approach. In his On the Gods and the World, Sallustius explains that myths can be theological, psychical, and sometimes material in their content. Essentially what I am arguing here is that because “pagan” culture was effectively killed off, the seriousness and meaning of mythology was lost. Mythology and the gods are thus treated as subservient to monotheism, because either society won’t allow it to be equal, or we assume it cannot be equal. I think it is both. Pop culture reveals our attitudes and how we play with things like religion and myth. Reflect back on the shows and movies you have watched that had to do with mythology in some way. How was it portrayed? You’ll notice a theme in how mythology is used. Supernatural on the CW is one of my favorite shows because of its involvement with myth and religion. In this show, Dean and Sam are hunters, who travel around the United States killing monsters. Throughout the series they sometimes encounter gods. The gods are always causing trouble and doing harm, and Dean and Sam end up killing many of these gods. There is one episode where Dean and Sam end up at the Elysian Fields Hotel, where various gods are meeting to deal the oncoming Judeo-Christian Apocalypse that was started by Lucifer. Lucifer arrives at the hotel, confronts Mercury, calling him and the other gods “petty little things, worse than humans, worse than demons, yet you claim to be gods.” Lucifer goes on a rampage where he kills off almost all the gods in the hotel. Only in our monotheistic world would such a plot happen. All of this stems from our loss of paganism as a legitimate living tradition. The divine mythology is degraded to fairy tales, shrugged off as irrational stories from primitive society. For mythology to be treated seriously once again, we must treat them seriously. Mythological hermeneutics needs to return. I ask that you revisit your myths and contemplate on their deeper meaning(s), dig beneath the surface of the story, you’ll find gold of wisdom underneath. The word Hellenism is used extensively in most HELLENIC organizations, as well as in the media. Since this is such an important term, do we really understand what it stands for, what it really means and who initiated it? Is it about the mythical heroes and gods that the ancient Greeks developed to explain the natural as well as the supernatural events that surrounded their lives? Is it how ancient Greeks pursued excellence in physical, moral and intellectual endeavors? Is it about the achievements that ancient Greeks achieved 2,500 years ago in the areas of architecture, language, poetry, education, sciences, philosophy, drama and such? Is it the influence that their numerous original ideas had on Western Civilization on self-governance by democratic rules? I believe that Hellenism is all of the above and a lot more. Fortunately, most of the achievements of the ancient Greeks have been recorded in thousands of books which are in libraries all over the world. This legacy also is rooted in the various structures, statutes, paintings and other such art that have survived from the 4th and 5th centuries, B.C. Examples of some of these achievements are also showcased in places such as the Acropolis, Delphi, Olympia, as well as other ancient sites and museums around the world. Accomplishments left to us by our forefathers the ancient Greeks are often called: "The Ancient Classics" and ancient Greece is often referred to as the "Crucible of Civilization." One of the most important definitions of Hellenism is: "The Foundation of Western Civilization." The term emphasizes that almost anything that is used today by the Western civilized world had its origin in ancient Hellas over 2,500 years ago or more. * ISLAM is not my religion. * CHRISTIANITY is not my religion. * BUDAISM is not my religion. * JUDAISM is not my religion. 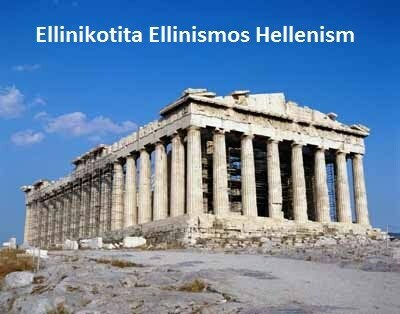 * MY RELIGION IS HELLENISM! * Το Ισλάμ δεν είναι η θρησκεία μου. * Ο Χριστιανισμός δεν είναι η θρησκεία μου. * Ο Βουδαϊσμος δεν είναι η θρησκεία μου. * Ιουδαϊσμός δεν είναι η θρησκεία μου. Γεννήθηκα άνθρωπος και πρέπει να πεθάνω ως άνθρωπος... δηλαδή σαν ένας μικρός θεός!! !